Unfortunately, some problems just can’t be fixed, and I think this is one of them. Is it true that when a Gnome laughs a Dragon gets its wings? I think we have an anatomy problem here, because I feel quite confident that dragons are born with wings. You’ve seen whelps hatch from eggs, right? They have wings! But if they don’t naturally have wings and are instead granted them by the power of Gnomes (presumably before hatching), then I’m more powerful than I realized! A single laugh could cause swarms of dragon whelplings to take flight, terrorizing the skies in my name! 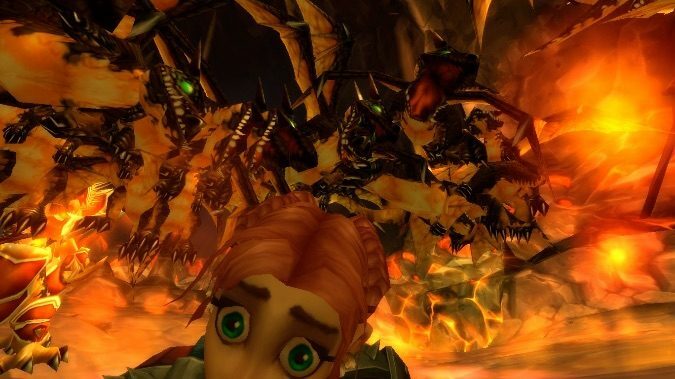 I think that the Horde vs Alliance conflict is more like a Horde vs Alliance leaders conflict. I think it’s a bunch of unfinished bussiness (Genn vs. Sylvannas, Tyrande vs. Garrosh, Jaina vs. all the horde, etc) that somehow managed to encompass entire countries and that common people in both factions would be perfectly fine with a long truce, even lasting peace between the factions. What’s your opinion on this? There’s certainly a lot of personal animosity involved in the current conflict, I agree. However, just because we see these conflicts amongst or leaders doesn’t mean that the average citizen of the Alliance or Horde doesn’t have their own animosity towards the opposing faction. Residents of Stormwind or Ironforge might be content to stay safe within their territory, where they aren’t threatened by the Horde, and only deal with their own threats. But what of their allies the Night Elves, who are constantly harassed by the Horde? The Elves have plenty of reasons to fight the Horde, even without the influence of their leaders, and the rest of the Alliance is equally obligated to aid them. And it didn’t exactly work well when Genn Greymane decided to nope out of the Third War by building a giant wall around his kingdom instead of going to the aid of his allies. …for which I continue to hold a strong animosity towards Genn, though I am obligated to share a faction with him if I want to play a Gnome. He selfishness certainly helped the Scourge attack Loaderon and Silvermoon… which led to the fall of his now-nemesis Sylvanas and the formation of a Horde bastion in the ruins of Loadaeron, right on his doorstep. Not to mention unleashing the Worgen when he finally had to act against the Scourge, which wound up cursing his entire race. Despite his rage for Sylvanas, I feel he very much created his own doom, and I don’t trust the guy. I don’t really see how anyone else could entirely trust him either, or quite how he’s became the right-hand man of Varian and then Anduin. His rage, I think, will get him into trouble in the end, but he’s hardly the only member of the Alliance with reasons to hate the Horde. For the Horde’s part, that’s harder, as the Alliance are rarely the aggressors. But I suspect all these years of war are hard to overcome, and will be harder to overcome when the Alliance retakes Lordaeron. The game’s story may focus on Genn and Sylvanas, but I hardly think everyone else would just peace out if, somehow, the two of them stopped fighting. Which Hearthstone Character would you like to see in WoW? In my case i would like a storyline around Rin, the first Disciple (Warlock Legendary in HS) and Azari The Devourer. I mean, just look at her, she is an awesome elder warlock demon worshipping gnome woman who killed her kin in order to start the cult of Azari, a powerful demon we havent heard of.The possibilities are great, maybe Azari is an independent demon, or maybe is a lesser demon taking advantadge of a power vacuum, maybe Rin always had magic potencial but she never got a chance in life until Azari came to her, i dont know, there are some cool characters in HS that are from the world of warcraft but are actually not in WOW. Some of them might be good additions. Hearthstone has a lot of crazy characters, but if I were to choose just one… well, it’s no surprise that it’s a Gnome. The new expansion has a Mage card called Toki, Time-Tinkerer and she is my favorite. Give her a long quest chain with Chromie where the two of them spend a zone-spanning quest chain arguing about the proper use of time travel and sending you on a lot of contradictory quests. I need this in my life, Blizzard. Help a Gnome out here. Random Q4tQ: I have a second account that is not currently active but has up to Cataclysm unlocked on it (I’m just not paying the monthly subscription). If I were to pay for the BfA/free Legion combo, would it also unlock panda-land and AU!Draenor? Or would I have to buy a new ‘base game” key? Yep! After an expansion is released, typically the previous expansion’s content is rolled into the base game — with Legion, Blizzard is just doing it a little early. What is the quickest way to get a low level character from Silvermoon to Stranglethorn? If you look at the map, you would think this is a nightmare of a trip — but it’s not nearly as bad as it appears. There’s a red orb at the back of the throne room in Silvermoon City that will teleport you to Undercity. From there, run to the blimp tower in front of the city gates to hitch a ride to Grom’gol in Stranglethorn. It’s relatively fast and relatively safe. Which is to say: you kids have it easy these days. Back in my day, I had to corpse hop all the way through the Wetlands to reach the nearest boat dock to Stormwind or Ironforge — and those roads were not safe for lowbies. Blizzard has really taken all of the challenge out of this. Though in fairness, that takes most of the annoyance out of it, too. I guess I’m okay with that. And that’s it for today, everyone. Come back tomorrow for your weekly adventures with Anne, and I’ll be back next week.